Over the last few weeks, I’ve been inundated with numerous questions from many new mommies mostly around the topic of returning to their Pre-Pregnancy weight as quickly as possible AND what to eat and also how much. By the way, I LOVE MEETING AND INTERACTING WITH NEW MOMMIES! As a new Mommy myself, this might seem like an overwhelming task to think of especially when mothering a new baby is at the forefront of our minds so breaking it down to 2 simple steps will help ease the transition. 1) When it comes to getting your Pre-Pregnancy body back, I always suggest TAKE YOUR TIME especially if you’re breast feeding because this can take several months to even a year to achieve this. A good portion of the weight that a pregnant woman gains is basically an “energy deposit” to meet the extra caloric demands of breastfeeding . The great news is, this energy deposit is consumed gradually while we nurture our child so we will lean out. I suggest waiting until the baby is at least 3-4 months old before making a specific effort to lose weight because we need the time to recover from the birth and also establish a healthy milk supply for baby. Even with my regular clients, slow and steady always wins the race so that goes the same for my Postnatal clients – lose the weight slowly! Every single Mommy needs enough energy and nutrients to get through the day to be healthy, active, and strong to care for their child or even children so don’t rush the process. 2) Now the million dollar question is “how much do we need to eat” followed by “what should we eat”. The truth of the matter is every mother is different and the amount of calories one needs to consume often depends on how much body fat they carry and also how active they are. In a nutshell, new mommies should certainly be consuming more calories than their maintenance levels to provide an ample supply of milk to their babies so some extra weight gain is perfectly normal and should be expected. More importantly food quality is critical so the combination of higher calories from quality (and natural) food sources will automatically be accompanied by an increase in all other vital nutrients. Tying both points together, the extra weight we gain at the end of pregnancy will gradually be used up during breast feeding despite the increase in calories. Of course I suggest increasing activity levels for the purpose of being a strong mommy and to be cognizant of what the body truly needs in terms of food intake after all is said and done. 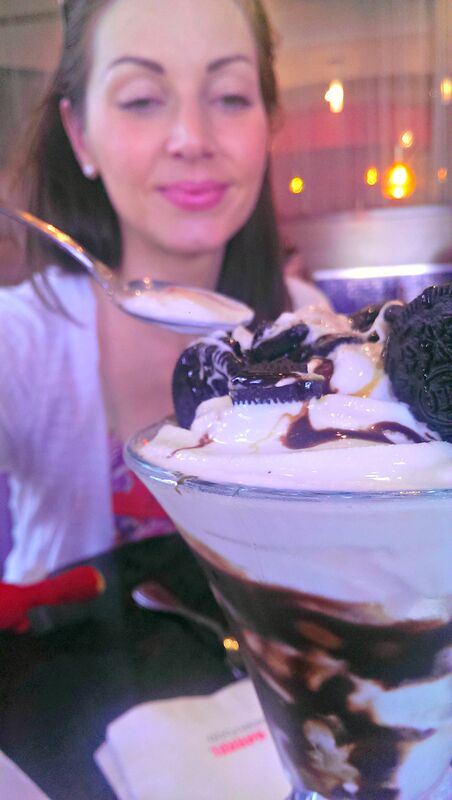 For me personally, I’ve begun more regular weight training and because I was highly active #before pregnancy as well as #during, my typical energy requirements as a mommy are much higher than most allowing me the flexibility of more calorie dense foods (like this delicious #OreoSundae) on top of my regular diet going as high as 500-700 #extra calories per day. Previous PostSTRONG LIKE MOMMY Biweekly Progress – Ana G.